Heat 1 tablespoon of the oil in a casserole set over a medium heat. Brown the lamb in batches and set aside. In the same pot, fry off the onion until soft, then add the garlic and spices and cook for another 2 to 3 minutes. Put the meat back in and add the tomatoes, chicken stock and a little water if needed to cover the meat. Season with salt and pepper. Bring to the boil, then reduce the heat and simmer for about 45 minutes, stirring occasionally. 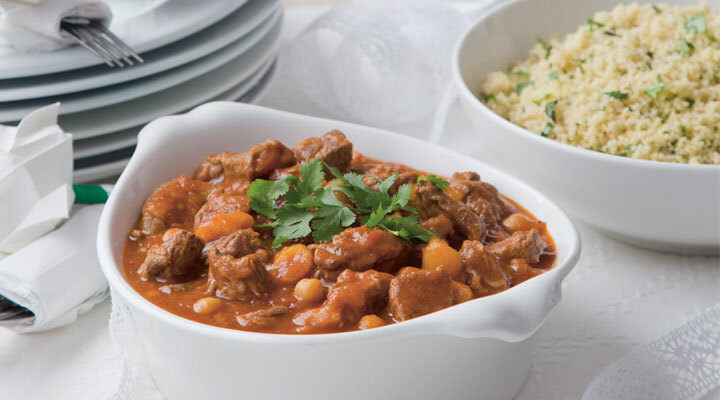 Add the chickpeas and apricots to the pot and cook for a further 20 to 30 minutes, until the lamb is tender. Reduce the sauce if needed and check the seasoning. Garnish with chopped fresh coriander before serving with the herby couscous.